If the look of your smile, the strength and alignment of your bite, or your self-confidence are compromised by missing or damaged teeth, our variety of restorative treatments at OC Lifesmiles can provide a solution. As an experienced dentist, cosmetic dentist, John Cross, DDS not only seeks to give his patients a beautiful smile, but also to restore lost functionality to those who struggle with cracked, chipped, decaying, or missing teeth. By combining his artistic eye with his intricate knowledge of the teeth and gums, Dr. Cross strives to achieve results that improve both the aesthetics and function of your teeth. Dental implants can serve as permanent replacements for missing teeth. Using a titanium post that acts as an artificial root and topped with a porcelain crown, dental implants have the ability to fully restore functionality to your teeth with natural-looking results. In addition, dental implants can be cleaned and maintained just like natural teeth. The most accurate and precise placement of dental implants is essential for results that both look and feel natural. Dr. Cross utilizes state-of-the-art, surgically guided dental implant techniques to reduce risks of complications, improve accuracy, and provide the best possible outcomes. An alternative to traditional dentures, implant supported dentures offer a more stable and comfortable form of tooth replacement. Using dental implants to secure your denture into place, this method of teeth restoration can minimize denture slippage while eliminating the need for messy adhesives. Implant supported dentures also typically look and feel more like natural teeth. With the All-On-4® method, Dr. Cross can use four dental implants to secure a full arch of replacement teeth to the top or bottom jaw. 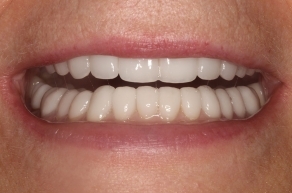 For full mouth restoration, eight dental implants can secure both the top and bottom dentures. This method of securing dentures offers many patients with reduced jawbone density the opportunity to enjoy the benefits of dental implants. In some cases, temporary fixed dentures can be placed on the same day as surgery! CEREC® (Chairside Economical Restoration of Esthetic Ceramics) technology allows Dr. Cross to produce tooth restorations on-site in a single visit, reducing the number of office appointments required to complete your treatment. This innovative tool allows us to make porcelain crowns, veneers, inlays, and onlays that are custom-designed for your unique needs right here at our practice, without the need for an outside dental lab. 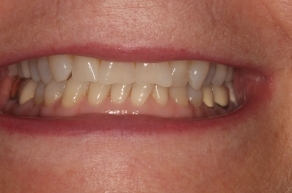 Full or partial dentures can be an excellent solution for those who have missing teeth. At OC Lifesmiles, dentures are custom-made for our patients using durable materials that are convenient and comfortable to wear. Our professionally crafted dentures mimic the appearance of your teeth and gums for a natural-looking solution that can restore form and function to your teeth. To help you determine whether dentures are the best restorative option for you, Dr. Cross can assess your unique situation and concerns. Chipped, cracked, or decaying teeth can be just as troublesome as missing teeth. In addition, gaps between teeth can cause difficulty when eating or speaking. 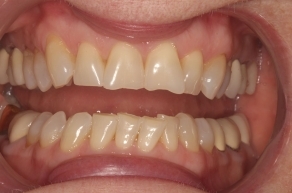 With porcelain crowns and bridges, Dr. Cross can strengthen and protect these compromised teeth with natural-looking outcomes. 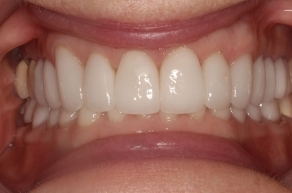 Porcelain crowns and bridges are custom-tailored to address your individual concerns with results that look and feel like natural teeth. The color of the restorations is matched to your surrounding teeth, and they are bonded with a strong dental cement for long-lasting results. After treatment, our patients have experienced improved esthetics and functionality in addition to more confidence in the appearance of their smiles. Very special people here who care for every patient’s special circumstances. Everyone has a story and they honor that. Full mouth rehabilitation combines a number of our cosmetic and restorative procedures to give your smile a full makeover. Depending upon your individual needs, Dr. Cross will recommend which treatments can best restore the function and beauty of your smile. Full mouth rehabilitation is typically reserved for patients who are missing a significant number of teeth, have severely damaged teeth, or have a large number of cosmetic and/or functional concerns they wish to address all at once. This comprehensive procedure can include treatments such as dental implants, porcelain veneers, teeth whitening, gum reshaping, or other options. During the consultation process, Dr. Cross can help you decide which combination of treatments can best achieve your goals. If you would like to learn more about our restorative dentistry solutions, or if you would like to schedule an appointment, please contact us today.